I haven’t paid attention to basketball since the men wore shorts — I mean shorts, not the baggy capri pants they wear now. Back then, I was the nerdy girl who hand wrote the stats and charts for the the men’s varsity basketball team in high school. (Hey, it helped me get on the jock radar and I ended up dating the captain of the team — not my high school team, but it was still aces!) However, I’ve long since hung up my basketball interest — except for when it comes to helping girls meet guys. Now that March Madness aka The Big Dance is in full swing, I strongly suggest that women pay a bit of attention to basketball. The NCAA Tournament dominates the attention of North American males, so single ladies who want to participate in interactions with men should pay a bit of attention to college basketball. Wise women, including the married variety, will not pretend to have an interest in something they do not; however, there is a simple way to garner some male interest this time of year: make a bet on the college basketball tournament. You don’t have to know a whole lot about the sport, or bet a lot, to make things interesting. Just pick a team and make a bet that you can accept losing. And then talk about it! Cheer and groan along with the televised game and your passion will attract interest. Let’s face it, betting on anything makes you more interested in it. And whether you truly understand the whole bracket thing or not (someone will be more than happy to educate you anyway), whether you just picked a basketball player’s name that sounded familiar, or whether you picked because you like the team’s name or mascot, you’ll soon find yourself rooting and hooting along with the rest of the sports bar crowd. Don’t forget to make some side bets with the men you meet, your male buddies, your husband, etc. Those bets can be far more interesting… The loser pays for drinks, buys dinner, has to put out the garbage — or just had to put out. *wink* Yes, these bets can be far more interesting. And even harder to lose! But don’t forget to make a cash bet on the tournament, or several bets on some of the series of basketball games, for it’s the combination of you putting your money where your mouth is and being passionate about cheering on the games that gives you — and the guys — something to talk about! You can bet on the March Madness — and get a 50% bonus — online here. 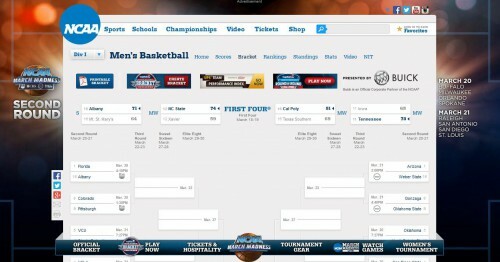 This entry was posted in Dames, Games, Romance and tagged betting, couples, dating, March Madness, online gambling, sports. Bookmark the permalink.